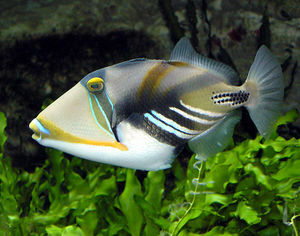 Please copy and paste ' [[Category:Triggerfish]] ' into the end of your article to include it in this category. Triggerfish belong to the family Balistidae. Often marked by lines and spots, they inhabit tropical and subtropical oceans throughout the world, with the greatest species richness in the Indo-Pacific. Most are found in relatively shallow, coastal habitats, especially at coral reefs, but a few, such as the aptly named Oceanic Triggerfish (Canthidermis maculata), are pelagic. While several species from this family are popular in the marine aquarium trade, they are often notoriously ill-tempered. This page was last edited on 16 October 2015, at 13:06.